When ever you see a show about ‘extreme’ cuisine, or read an article about the ultimate (Insert Food Item Here), there is a pretty good chance that the ‘extreme’ item will include some bacon. Bacon has reached almost mythical status in the food world. Its presence in a recipe can create instant appeal and desirability. 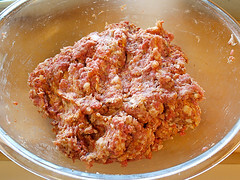 So, while I was contemplating how to incorporate bacon into a hamburger recipe, creating my own version of an ‘extreme ‘ burger I saw on television, I wondered what a bacon meatball would taste like. I love a challenge! 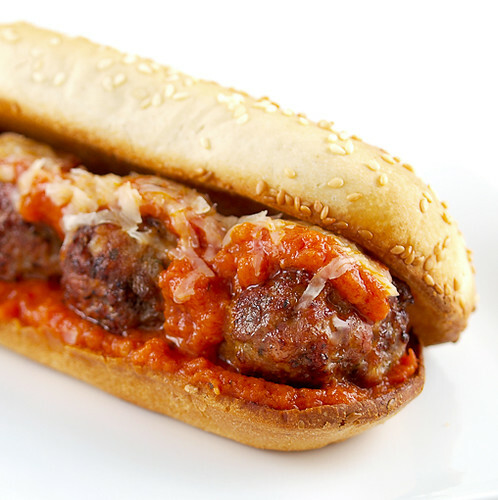 These are, bar none, the best meatballs I have ever had. Ever. 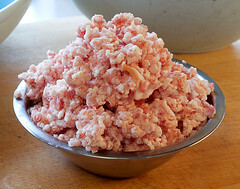 The ratio of bacon to other ground meats, in this case ground chuck and ground pork, is about 40/60. 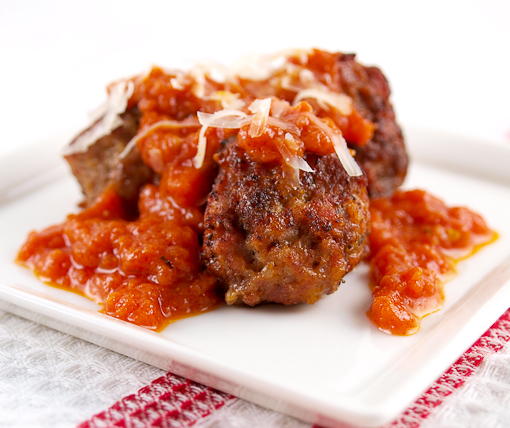 I did not use any fillers such as bread crumbs or rice, and there are no vegetables hiding in these meatballs. What you have here is all meat, a little spice and one egg to help hold it together. The most important advice I can give you is to use a light touch when mixing. 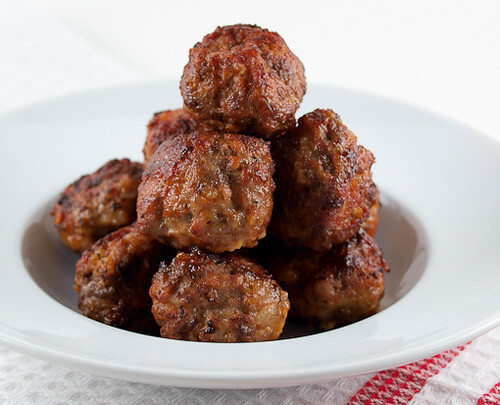 Overworking the meats will result in tough meatballs, but if you don’t over-mix or compress the meatballs too much you will have tender, juicy, instantly addictive carnivore pleasure. 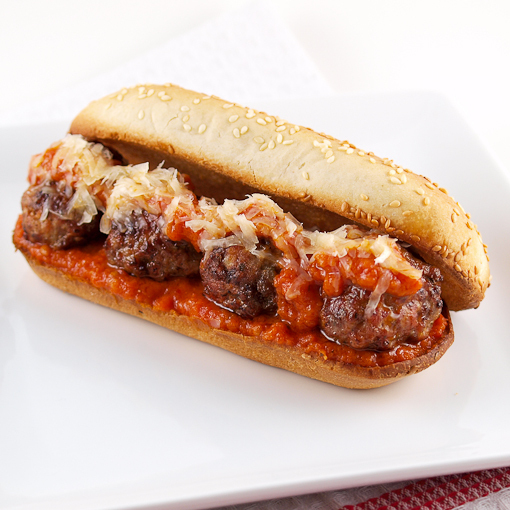 These make an insanely good meatball sub*, paired with some spicy tomato sauce on a toasted garlic roll, which is how I used them up! 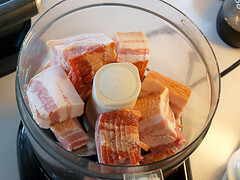 Cut the bacon into 1-inch pieces and place into the bowl of a food processor. Pulse the bacon until it is evenly ground and no large chunks of bacon remain. In a large bowl combine the bacon with the remaining ingredients. Mix gently until evenly combined. 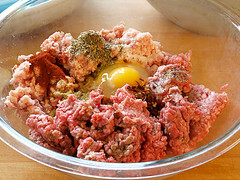 Scoop the meatballs into 1½-inch balls, making sure not to compress the balls while shaping. Place on a parchment lined pan and chill, uncovered, for at least two hours. Heat the oven to 400F. 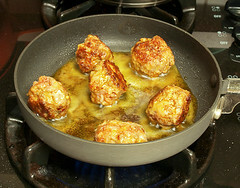 Once the meatballs are chilled heat a non-stick skillet over medium heat. 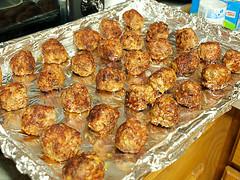 Working in batches, add the meatballs and brown thoroughly on all sides. 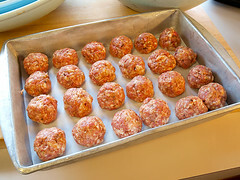 Transfer to a baking sheet until the rest of the meatballs are browned. 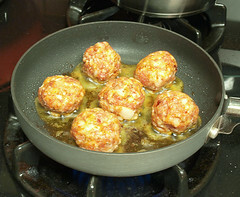 Bake the meatballs until the meatballs reach an internal temperature of 160 F, about 10 to 15 minutes. Cool slightly before serving. For the sauce I used the sauce recipe found here with 1/2 teaspoon ground fennel, 1/2 teaspoon dry oregano, 1 teaspoon crushed red pepper, and 1/4 teaspoon dry thyme added. For the rolls melt 2 teaspoons of butter per roll with 1/2 clove fresh minced garlic. Brush the butter on each half of the roll and toast until golden. I added a little shredded mozzarella cheese, too. Enjoy!